"T", a reader from Owen Sound, Ontario, wrote to tell us ..... 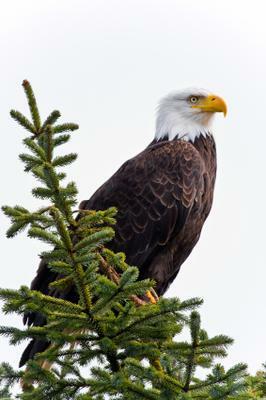 I saw a Bald Eagle last week in Allenford, (near Sauble Beach) flying over the river. I have never seen one in this area for as long as I have lived here, which is 35+ years. I wasn't sure that they even lived in this part of Canada. I was quite shocked to see one actually and had to double take. It was a beautiful bird to see. Don wrote to tell us about his Bald Eagle sighting in Peterborough, Ontario ..... My wife and I were coming out of a Tim Horton's in Peterborough, when I looked up, as I do always, and saw a Bald Eagle circling over head, this went on for about five minutes (circling), and it then headed over to the river that runs through town. This was last week. Gary from Oshawa, Ontario, wrote to tell us ..... I saw a Bald Eagle in Oshawa near the downtown core with a two foot long fish in it's grasp, high in a tree around Oshawa Boulevard and Arthur Street area.